Is Baldivieso really that bad? Fans of Al-Fida'i have been up in arms for the last two months when it became evident that Julio Cesar Baldivieso would take the reins of the national team ahead of the 2019 AFC Asian Cup. The decision was a perplexing one to say the least- why would the Palestine Football Association let go of a manager that led the national team to dizzying heights? The role of Turki Al-Sheikh and the General Sports Authority (GSA) of Saudi Arabia- who are acting as financiers- has rightly been questioned. Although an understanding had been reached between the two federations, there is still a significant amount of bad blood harbored by the fans and players towards Saudi Football. The saga that unfolded during 2018 World Cup qualifying has not been forgotten, nor forgiven, in many parts of the Holy Land. From a personal standpoint- I do not think the decision to take the deal from the GSA was a good one- even if it sees $1 million pumped into Palestinian football. The string attached to the deal was to do a favor at the expense of a loyal- and extremely successful- servant. The point of this article is not validate the decision but to analyze the work of the man stuck in the middle- Julio Cesar Baldivieso. To paint Baldivieso as incompetent is unfair and disregards 10 years of work as a manager- not to mention his stellar playing career. Detractors point to his time in charge of Bolivia while ignoring his most recent job- which saw him and his staff set a record for the best Venezuelan Apertura/Clausura point total in a single year. He also won a silverware with a tiny team (Aurora of Bolivia) in 2008. Moreover, his overall winning percentage as a club manager (44.3%- 1.52 PPG) is respectable. Perhaps it's best to compare Julio Cesar Baldivieso to his more illustrious counterparts to see how he stacks up. 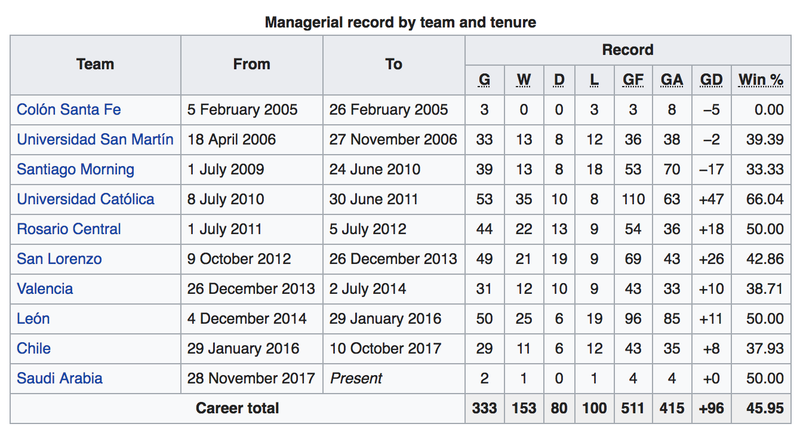 Here's a snapshot of Juan Antonio Pizzi's time in charge (courtesy of Wikipedia). The numbers are alarmingly similar at club level- Pizzi had an earlier start and an extra 90 matches to his name. That said in his 302 games in charge- he won 46% (1.66 PPG) of his games and did that with more illustrious clubs. In fact, Pizzi is perhaps best known for two epic failures- failure to qualify Valencia for Europe in 2014 (the first time that happened in 16 years) and the failure to qualify Chile for the 2018 World Cup. His trophy cabinet-the ceremonial 2016 Copa America aside- is not bursting at the seams, either. He won the 2010 Chilean League title (the one season it wasn't split over two phases) with Universidad Catolica and won the Apertura in 2013 with San Lorenzo. Not impressed by Pizzi, either? 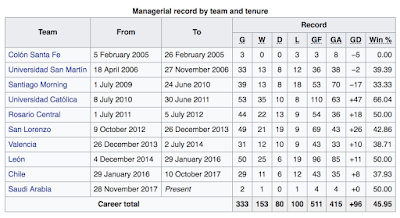 Well, let's compare Baldivieso to another South American manager who qualified for the 2018 FIFA World Cup and did so with a near perfect record. 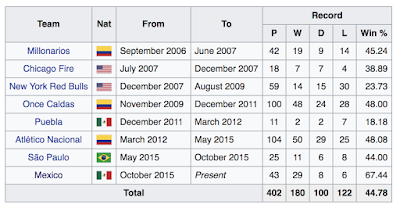 Colombian Juan Carlos Osorio has done a solid a job with the Mexican national team- leading them on a 22 game unbeaten run en route to qualifying for the World Cup. What did Osorio have on his CV before taking the role? A good stint at Atletico Nacional and not much else. He was a flop in Mexico and below average in MLS. In fact, the Colombian's win percentage as a club manager is nearly identical to that of Baldivieso's (42%- 1.51 PPG). The big difference between Baldivieso and his more illustrious South American counterparts is the noteriety of the clubs they led. Baldivieso got one shot at a managerial post out of his native Bolivia but that has not been enough to mask his failure as manager of the Bolivian national team. So much so, that the vitriol expressed Baldivieso's first game in charge would have been enough to make most observers think Palestine had lost by a healthy margin. Instead, Palestine replicated the result they achieved on the very same ground two years ago- a 1-0 win against Algeria's Olympic side. It was not a resounding victory by any stretch of the imagination but Palestine showed professionalism in achieving a result in a meaningless friendly. That said, fans remained convinced that what happened with Bolivia will happen with Palestine which is nothing short of hyperbolic equivocation. Bolivia have been the whipping boys of South American qualifying for over 10 years finishing last or next to last in every qualifying tournament stretching back to 2002. The Bolivian league is widely regarded as the weakest on the continent, and from a pure talent standpoint, every other nation in South America is in a better position. Baldivieso was not helped when his captain and top scorer decided to quit the national team before he had a chance to lead them in a competitive match. Yes, the results were not great, but they rarely ever are for Bolivia in World Cup qualifying. The Copa America did not go to plan for them either but they were hard done by- especially in the game against Chile. When Baldivieso was dismissed from his post following the tournament's conclusion- results did not immediately improve, even though the team was reinforced with its best defender (Raldes) and attacker (Moreno). Bolivia collected 3 points in its first six games under Baldivieso and marginally improved on that by collecting four points in their next six (a draw and win against Ecuador and Paraguay at home). That stretch however included two 5-0 thumpings at the hands of Brazil and Venezuela. Yes, Bolivia ended up with 14 points by the end of the campaign but some results lack context. A draw against Brazil was secured after O Selecão had qualified, they beat a Messi-less Argentina, and then faced Chile on what might have been their worst week in the last decade. Simply put, you could put any manager in the world of football in charge of Bolivia, but not much would change. Baldivieso was not a historically bad as manager of his nation's national team- his results were par for the course in the notoriously difficult CONMEBOL World Cup qualifying tournament. How will Baldivieso do as Palestine manager? To succeed in his post, Baldivieso does not need to be a miracle maker. He will need to adapt to a different environment and a new culture, but the expectations as compared to the talent level are reasonable and achievable. The Bolivian tactician passed the first litmus test by beating Algeria's U21 team. Some might scoff at the level of opposition, but Algeria's youngsters are far better than the likes of Bhutan or Maldives. Many starters are regulars for their clubs in the Algerian top flight and could probably qualify for the expanded 24-team Asian Cup. Palestine was not spectacular, but this was an unofficial friendly and sterner tests lie in wait. Palestine will have another unofficial friendly against Bahrain to finalize their game plan against Oman. The Oman qualifier is, on paper, a dead rubber. A win, however, would most likely stem the tide of negativity from the fans. It would also set up Palestine quite nicely for next year- potentially catapulting Al-Fida'i into Pot 1 for April's AFC Asian Cup draw. At the finals, a quarter final berth is an achievable target and Palestine have the talent to make that happen. Their 23 month unbeaten run is testament to quality and consistency in the side. Veteran centrebacks Abdelatif Bahdari and Haitham Dheeb anchor the backline. Rami Hamadi has been flawless in goal, the full backs have been great, as has Mohammed Darwish in anchoring the midfield. Unlike several iterations of the national team in years past, Palestine can create and score goals through the feet of several players. The urge of many observers is to compare Julio Cesar Baldivieso to Ahmad El-Hassan who took the reins of the national team from another successful manager ahead of the 2015 Asian Cup. On the face of it history has repeated itself, but Baldivieso is a qualified manager with a solid track record and is taking over a team that is very different from the 2015 version. Those who care about the national team have every right to protest the decision making process and the direction of the PFA but Baldivieso is not emblematic of the PFA's shortcomings.